The 'red and dead' galaxies depicted on the right in the image below pack stars ten times as densely as our Milky Way. In the first couple billion years of the Universe, these galaxies pumped out new stars at a tremendous rate, but roughly ten billion years ago, they fell quiet. Now, they’ve got only red giants—the dying embers of once-active stars—to show for themselves. To find out, Tachella and her colleagues examined 22 now-quiescent galaxies using the ESO’s Very Large Telescope and the Hubble Space Telescope. The galaxies they chose were so distant that the light reaching Earth hails from an era roughly 3 billion years after the Big Bang. Using near infrared imaging, the researchers were able to pinpoint precisely where these galaxies were churning out new stars many eons ago. While most galaxies kept up a steady production of new stars at their edges, by early spring on the Cosmic Calendar, their bulging centres had already sputtered out. 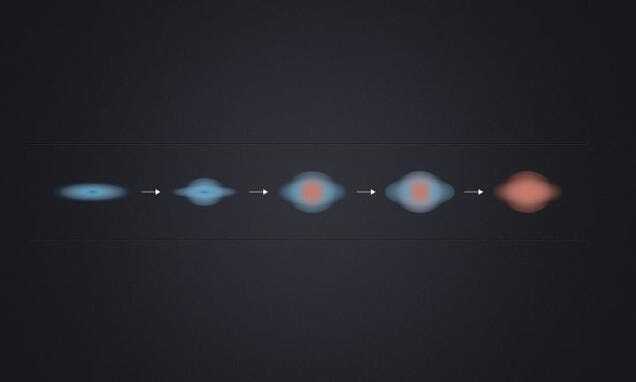 The diagram above illustrates the process of galactic decay the researchers are now proposing, with galaxies in the early Universe appearing at the left. Blue regions indicate areas where stars are being actively formed, while the red regions emanating from the galactic centre show the progression of a cosmic dead zone. The giant, spheroidal, “red and deads” in our modern Universe appear on the right. Why the Universe’s giant galaxies rotted from the inside out remains an area of ongoing investigation One leading theory is that black holes release torrents of energy that scatter star-making materials into the cosmic hinterlands, leaving the galactic centre barren. More research is needed to support or disprove that hypothesis, but the fact that we can peer ten billion years into the past, watch the slow death of distant galaxies and make such fantastical predictions in the first place, is mind-boggling.